This evening’s mission was a critical milestone for SpaceX, which has been working to make its rockets partially reusable since as early as 2011. Up until now, practically all orbital rockets have been expendable, so they’re basically thrown away once they launch into space. That means an entirely new rocket — which can cost tens to hundreds of millions of dollars to make — has to be built for each mission to orbit. SpaceX’s strategy has been to land its rockets after launch in an effort to fly them again and again. That way the company can partially save on manufacturing costs for each mission. SpaceX doesn’t save the entire Falcon 9 rocket after each launch though. It saves the first stage — the 14-story core of the Falcon 9 that contains the main engines and most of the fuel needed for launch. 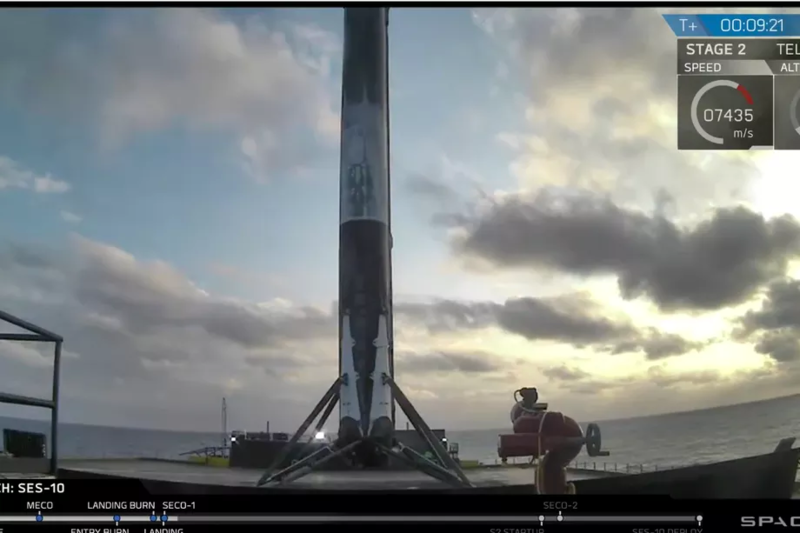 About a few minutes after takeoff, the first stage separates from the top of the rocket and makes a controlled descent back to Earth — either landing on solid ground or on one of the company’s autonomous drone ships in the ocean. Prior to tonight’s launch, SpaceX had attempted 13 of these rocket landings and eight vehicles had successfully stuck the touchdown. But as SpaceX slowly acquired a growing stockpile of recovered rockets these last two years, the company had yet to actually reuse one of these vehicles. Now with today’s launch, SpaceX has proven that part of a used Falcon 9 can successfully launch to space again. And the fact that the vehicle successfully returned to Earth in one piece means that the rocket is poised to launch for a third time. Now SpaceX can boast nine successful rocket landings, as well as a Falcon 9 that has gone to and from space two times now. The rocket used for today’s launch was the second Falcon 9 that SpaceX ever recovered. It was the vehicle used for CRS-8, the company’s eighth cargo resupply mission to the International Space Station. On April 8th, the rocket sent nearly 7,000 pounds of supplies — including an inflatable habitat module called the BEAM — to the station for NASA. After launch, the rocket then landed on SpaceX’s drone ship, titled Of Course I Still Love You. SpaceX decided to launch this Falcon 9 again first, since the company wanted to save the first rocket it ever landed — a vehicle that sent 11 satellites into orbit for the company ORBCOMM in December 2015. That stage is now on display at SpaceX’s headquarters in Hawthorne, California. Though today’s launch was historic for the aerospace industry, it was otherwise routine for SpaceX. The Falcon 9 help to loft a communications satellite for the company SES, which is based out of Luxembourg. The satellite, called SES-10, will eventually sit in a high orbit 22,000 miles up and deliver communications services exclusively to Latin America. SpaceX confirmed that SES-10 was successfully deployed shortly after the launch. SES had been very vocal about its desire to be the first company to launch on a used rocket. And there is certainly financial incentive for customers. SpaceX president Gwynne Shotwell has said that customers that fly on a used Falcon 9 could eventually get discounts of up to 30 percent. Since the cost to launch a Falcon 9 starts at around $60 million, launching on a used rocket could start at around $40 million. For the first few relaunches, though, Shotwell told Space News that the discounts will be more in the order of 10 percent. Neither SpaceX nor SES disclosed how much money was saved for this flight. If SpaceX wants to maximize the economic benefits of its reusable rockets, the best method is to launch these vehicles as frequently as possible. But before a rocket can launch again, it has to be inspected, refurbished, and tested a few times to ensure that it’s ready for spaceflight. It took SpaceX up to four months to get this rocket ready for flight today, according to Shotwell, but the company is working to trim down that turnaround time. SpaceX could have a lot of practice on that front soon, as it expects to launch up to six pre-flown Falcon 9s this year.